Is Canada truly the best place to live in the world? Well, ask me, and the answer is a resounding: “Yes!” And to support my point, I'd like to point out that it has consistently been rated in the top 10 best countries to live for the past two decades (since 1990) by the United Nations. I'd say, right on! I love living in Canada... it's a scenic paradise! As they say, home is where the heart is, and my home and heart are both definitely right here! Aside from being a rich, first world country with an abundance of natural resources, Canada's vast kingdom of natural wonder is a nature lover’s paradise. 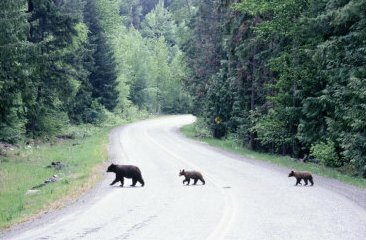 I may not be an avid camper, but I certainly appreciate beautiful nature scenery and I love spotting wildlife on our many road trips. Canada is home to lots of spectacular wildlife, amongst which are the famous Canada geese, but also the majestic swans of North America. I have always been fascinated by these beautiful, giant water fowl, and to find out that there are three different types of swans living in this beautiful country, just adds to my excitement. 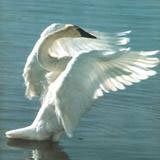 It's a breathtaking view to watch Canada geese, swans and other migratory birds on their migration route... It turns the skies into a beautiful spectacle! Canada firmly rates in the "top 10 best places to live" by the United Nations since 1990! You might think it's not fair to say that this country is "the Best Place to Live", since I haven’t seen all the countries in the world. However, one is entitled to one's opinion, and I promise, mine is based on the fact that I have lived in two other countries, before settling here in 2006. I have lived with my family in the United States of America for 15 years and my husband and I hail from Suriname, where we were born and raised. While growing up in warm, tropical Suriname, I always knew that a day would come when I would set out in search of the best place to live for myself. Back then I didn't know much about Canada, but I always felt attracted to North America; its 4 seasons, snow-capped mountains, and scenic landscapes with lots of exciting wildlife was hugely attractive to me. However, since we all get flooded by American TV programs and movies I was mostly attracted to the US... I wasn't familiar with Canada yet. After getting married, my husband and I moved to the United States, with high hopes that this would be the best place to live for us. We were fairly happy living there with just a work permit. Then we ran into trouble when our green card application was denied. 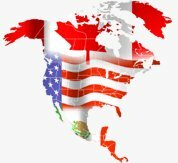 And that’s when we turned our attention for the first time to Canada… While living in the USA, we were too blinded by our desire to become American citizens to even bother to learn anything about this gentle giant of a neighbouring country. Be sure to follow the progress of my B.C. dreams on my vision board pages! Subscribe to my RSS feed for updates. However, once we discovered Canada's marvellous beauty, including its pristine nature scenery and its friendly people, we felt an instant connection. From the moment we filed our papers to come to Canada to the moment we arrived here, we grew fonder and fonder of this country. Once we finally reached our destination, we knew we had found our best place to live in the world. 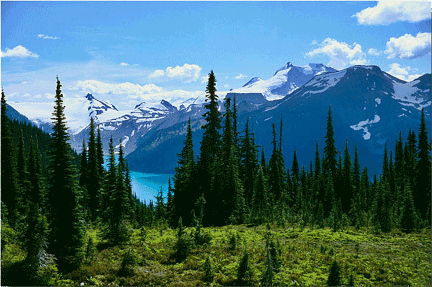 But, I still have a ways to go to reach my true paradise... Beautiful British Columbia...! See my vision board for more upcoming updates. 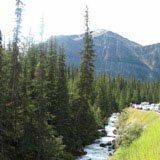 Although we've settled in the prairies, in Saskatoon, Saskatchewan, my ultimate goal is to move further west to British Columbia, a beautiful scenic paradise! I know I will reach my goal eventually, as British Columbia, with its dreamlike settings, is truly the best place to live for me. 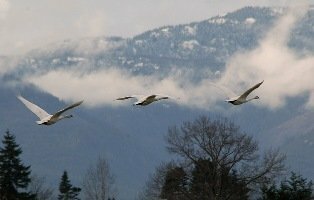 Aside from the beautiful mountains and the Pacific Ocean, it’s also sprinkled with breeding grounds for the Trumpeter swans! As they fly over the majestic mountains, soaring over the sparkling waters of the rivers, lakes and the Pacific Ocean, and as they bathe in its pristine waters, it seems that they too agree: British Columbia is indeed Swan Paradise... a breathtakingly beautiful mixture of picture-perfect landscapes and majestic birds! Through this Web site it’s my attempt to describe Canada’s spirit and beauty and why it deserves its reputation of being one of the best places to live, if not the best place to live! Plenty of images and videos to feast your eyes on!